Announcing the Winner of "A Baker's Field Guide" Giveaway! 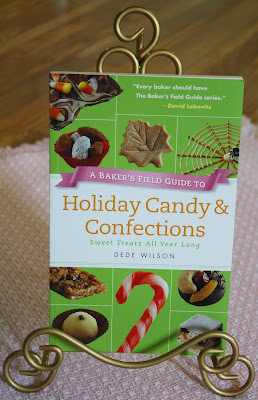 Just wanted to let you know that the lucky winner of A Baker's Field Guide--the four volume set--is Mary/Kit Redmond! 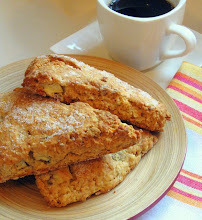 Mary confessed in her comment that her favorite cookie is a fabulous chocolate espresso shortbread. Sounds divine to me! To collect your prize, Mary, please email me at janessweets@gmail.com to send me your name and address. Your books will then be en route to you right away. Congratulations and happy baking! 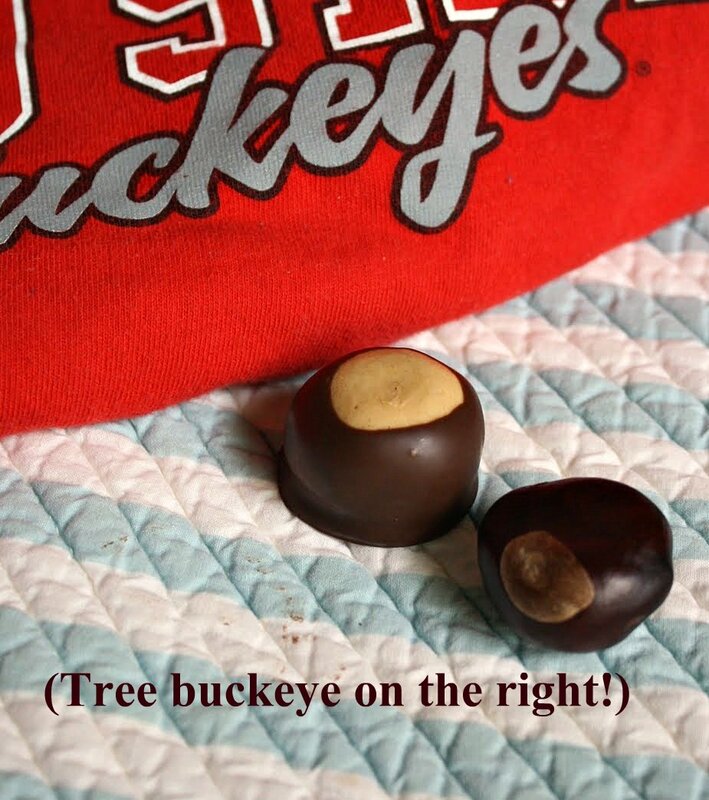 Will the real buckeye please stand up? 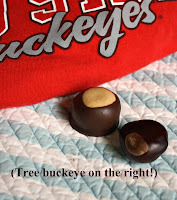 Because I wouldn't want to accidentally bite into the kind of buckeye that grows on a tree in Ohio. 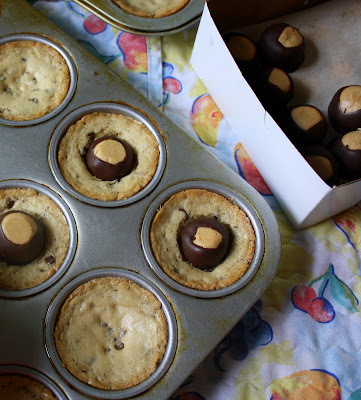 What I would want to bite into is the kind of buckeye that's peanut butter filled, dipped in chocolate, and plopped into chocolate chip cookie dough that's been baking in a cupcake pan. I knew it was inevitable that I'd eventually make buckeye candies the moment that Charlie, my older son, divulged his final college choice late last April. He was fortunate in having a few great options, and as the decision deadline approached, my husband and I were on pins and needles awaiting the verdict. We were both happy and relieved that the winning choice was Ohio State, land of anything and everything buckeye, and less than a four hour drive from our house. So last Sunday, after months of anticipation and weeks of preparation, we drove Charlie down to Columbus, moved him in, met his roommates, then said our hug-laden goodbyes. We'd successfully deposited our first child into the waiting arms of academia and, well, there wasn't much left to do but grab a hamburger and hit the road back to Michigan. Joy? Pride? Amazement? Apprehension? I feel them all. And I keep having non-stop mom-thoughts: Did he remember to bring an umbrella? He didn't pack that scary-looking hunting knife he owns, did he? Why didn't he bring that cute collapsible under-bed storage thingie I got him? Hmmm . . .
Now, our home is perhaps 25 percent quieter, there are fewer dirty towels to wash, and I don't have to wonder what time he'll turn into the driveway late on a weekend night. It's sort of as if he's away at a really big camp where they don't make s'mores or play taps at bedtime. But the kid's a force of nature, and I must say I miss him and the way he would always swoop in the backdoor after school or work, say hi to me, grab a snack, race to change his clothes, and swoop out the door again after giving me a peck on the cheek. That's my Charlie--a whirling bundle of barely-contained, teenage-boy energy. I hope they like energy at Ohio State. 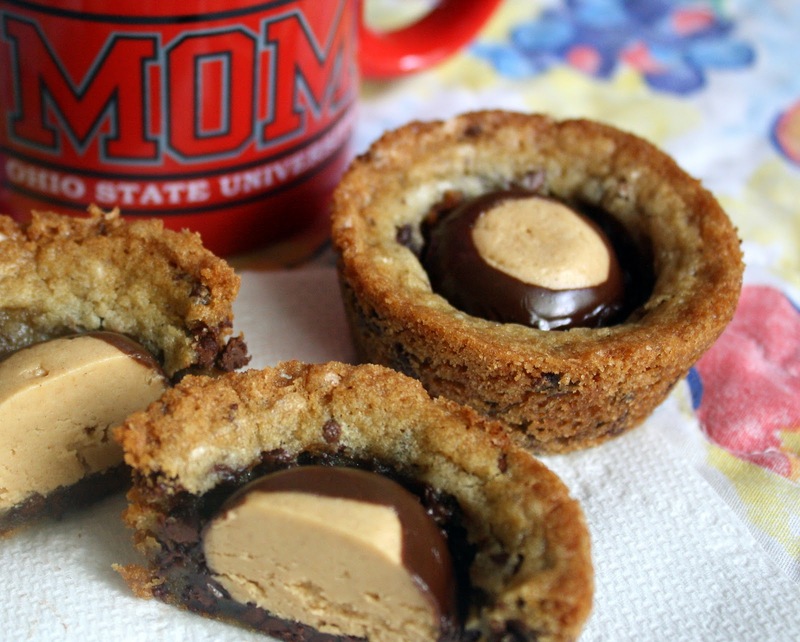 Thus, the Buckeye cookie cups . . .
Buckeye candies are a close cousin to the peanut butter cup. 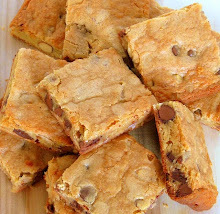 They're easy to make at home and so darn good. 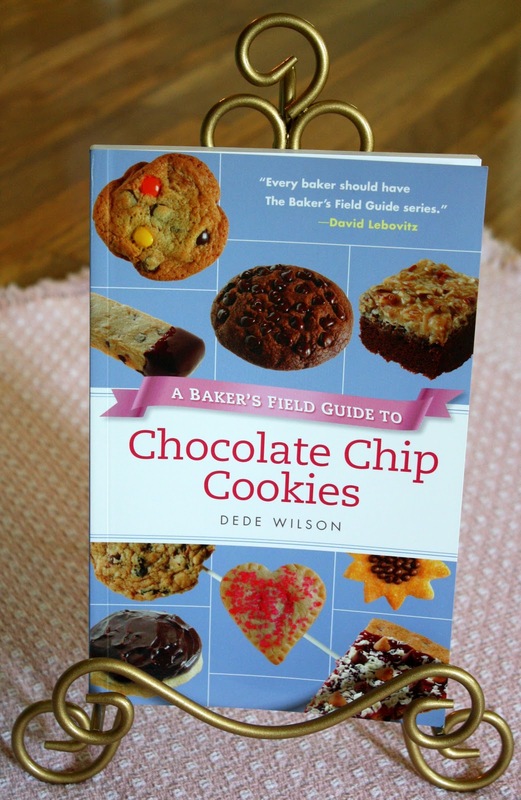 My idea to put them into this particular recipe came to me as I was browsing through my recently (and gleefully) received review copy of A Baker's Field Guide to Chocolate Chip Cookies, by Dede Wilson. That "field guide" above is just one volume in a fabulous four-volume set that also includes A Baker's Field Guide to Christmas Cookies, A Baker's Field Guide to Holiday Candy & Confections, and A Baker's Field Guide to Cupcakes. Holy moly! The Harvard Common Press of Boston was kind enough to offer me two sets of these wonderful books; one review set for me to keep (yay!) and one set to give away to one of you (double yay!). Thank you so very much, HCP! Do you want these books, too? Rhetorical question. I know you do. 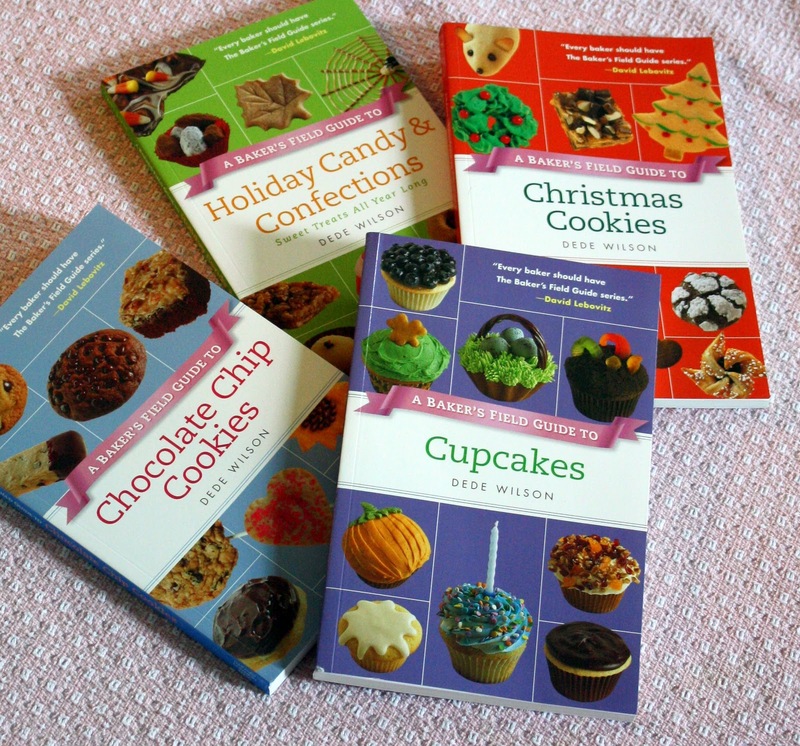 To throw your hat into the mixing bowl, so to speak, just leave a comment on this post telling me about one of your favorite cookie, candy, or cupcake recipes! That's all there is to it. I'll announce the lucky winner here on Wednesday, Sept. 28th, so be sure check back. About these recipes . . . In the large bowl of your mixer, on low speed, blend together the peanut butter and butter. Add in the salt and vanilla extract. Add in the confectioners' sugar gradually. You want the mixture to hold together easily when you roll a little glob of it between your palms into a ball, but you don't want it to be too soft. It should also not be crumbly. Keep adding sugar, and adjust the consistency as needed with more peanut butter. Form into balls no more than 1" in diameter (that's how big mine were and they were pretty hefty; I think smaller might be better! 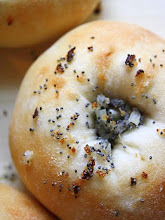 ), placing them on a parchment sheet placed over a rimmed baking sheet. Put the balls into the freezer while you melt the chocolate. Break up the chocolate into a small bowl and slowly melt it in the microwave, using extreme care to avoid overheating the chocolate, and stirring gently every now and then when you check it. 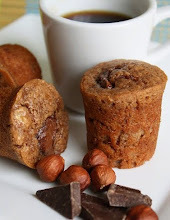 Be careful as well, to avoid getting any water at all into the chocolate; even one drop of water can cause it to seize, which will completely ruin it. Another option is to slowly melt the chocolate in a metal bowl placed atop a pan of gently simmering water (making sure the water doesn't touch the bottom of the pan). Depending on what kind of chocolate you use, and whether or not it's specifically for coating or not, you may find you need to thin the mixture slightly after it's melted; you can do this by adding vegetable oil a couple of drops at a time and gently stirring it in. 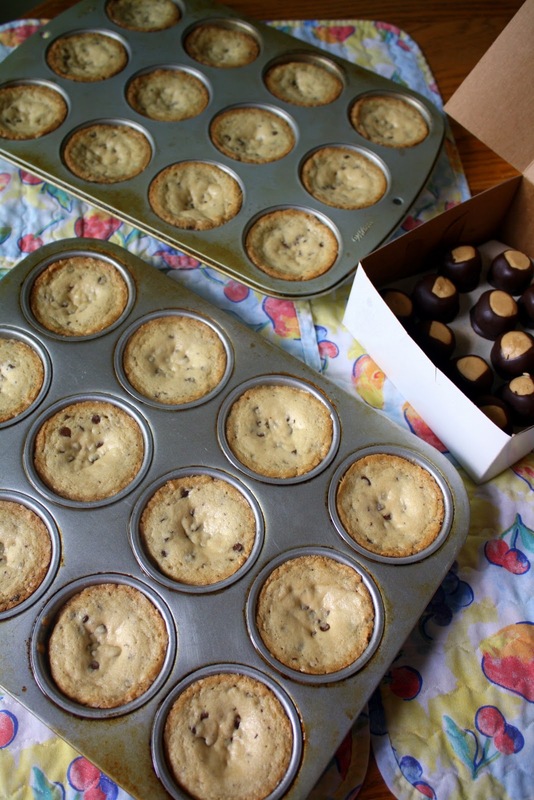 (If you are familiar with the process of tempering, and you want to use couverture chocolate for your buckeyes instead of the lesser coating chocolates available, go for it. 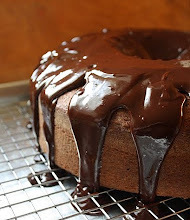 If you have no experience with tempering chocolate at all, though, now may not be the best time to give it a try.) The consistency of the dipping chocolate you use, whatever it is, should be fairly thin when melted. You may need to make adjustments as you see fit. 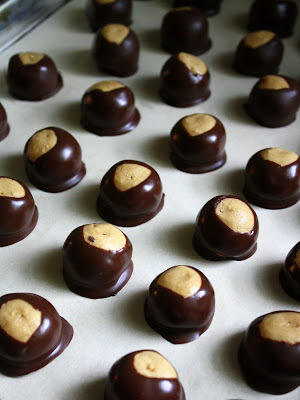 When your peanut butter balls are cold and firm, use a toothpick to spear each one, and quickly dip it into the melted chocolate, leaving an uncoated circular area on the top, and swiping the bottom gently against the edge of the bowl to scrape off the excess chocolate. Set each coated ball on the parchment covered tray. You may end up with a little hole from the toothpick. Once the chocolate has firmed up, you can safely try to smooth the hole closed with your fingertip. If you have a special candy-dipping fork, you may be able to avoid the problem of the little hole by using that instead of a toothpick. Experiment to see what works best for you. 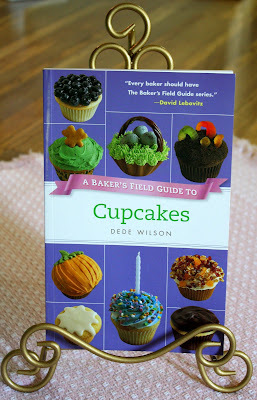 Grease 24 regular-size cupcake cups and then spray liberally with vegetable spray, or use paper cupcake liners in the pan(s). In a medium size bowl, whisk together the flour, baking soda, and salt. 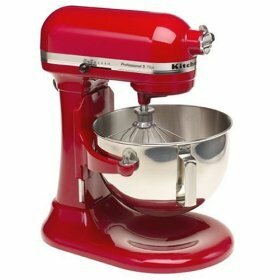 In the large bowl of your mixer, beat the butter until creamy on medium-high speed. 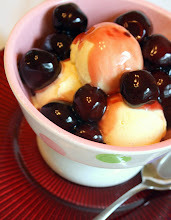 Gradually add in the two sugars and beat until fluffy, about three minutes, stopping to scrape the bowl periodically. Blend in the vanilla, then add the eggs in one at a time, beating each until well combined. Add one third of the flour mixture on low speed, mixing just until combined; add in the rest of the flour gradually. Don't over-mix. On the lowest speed, pour in the mini chocolate chips, beating only until evenly incorporated. Evenly portion the cookie batter into the cupcake pans (I used a no. 24 portion scoop; it holds 3 Tbsp. by volume). Bake for about 10 minutes, until the cups have begun to turn golden. 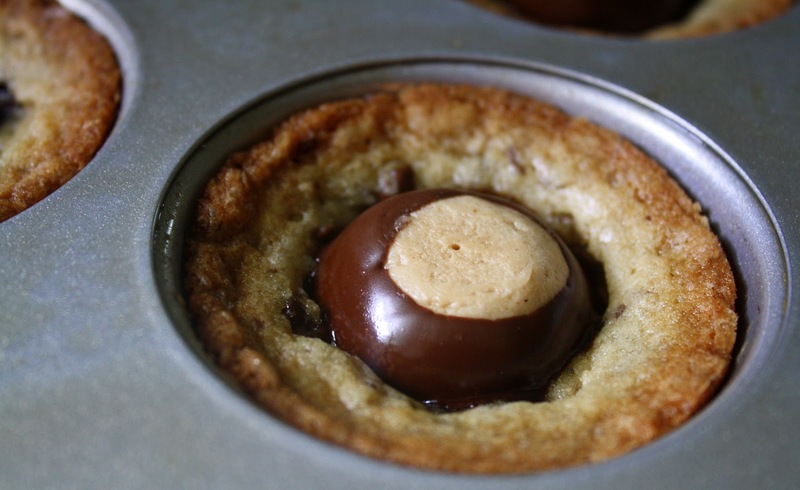 Remove them from the oven quickly and plop a buckeye into the middle of each one, gently pressing it down into the cup. Put the pans right back into the oven and continue baking for about 6 more minutes or so. When they're quite golden, remove the trays and set them to cool on racks. Run a thin knife or metal spatula around the edges of the cups to loosen them before attempting to remove the cookie cups. I learned a new word today . . . . pseudocereal. Yeah, I'm serious. It would seem that buckwheat flour is made from a plant that's not really wheat at all, but something that likes to masquerade as a cereal. Just as a pseudo-intellectual is a human who fancies himself worthy of the academic upper crust when in reality he's probably just mildly smarter than average, buckwheat has a similar identity crisis going on. Who knew plants could do that? Not to be confused with the Buckwheat character of Little Rascals fame, the common buckwheat plant, also known as fagopyrum, produces small triangular seeds that resemble the seeds of the beech tree; it seems the word buckwheat may be a derivation/corruption of the pronunciation of the Dutch words for beech wheat. Utterly fascinating, right? Mmm hmm, I thought so too. Okay then, moving on . . . So, did any of that factual flotsam and jetsam matter to me this morning as I was whipping these babies up? No sir, not a lick. All I know is that the basis for these hotcakes--pastry flour enhanced with a meaningful portion of whole grain buckwheat flour, a big over-ripe banana, a pinch of cinnamon, and a dollop of wildflower honey--make for a fabulous breakfast treat. 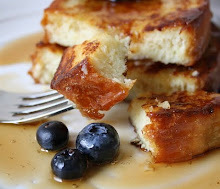 On the heavily traveled thoroughfare of the American pancake continuum, these lean toward the healthier side of town, but you'd never know it based on their rich flavor and pleasing texture. Drizzle even the tiniest amount of honey over them, along with a few extra banana slices, and you have something wonderful with which to start the day. Adapted from Kim Boyce's recipe for pear and buckwheat pancakes in her appealingbook, Good to the Grain, I halved the amount of buckwheat flour, used regular pastry flour instead of whole grain pastry flour, used mashed banana instead of pear, added in a smidgen of wildflower honey, used canola oil instead of butter, and tossed in a pinch of cinnamon to boot. And, of course, I reworded things to reflect exactly what I did. In a large mixing bowl, whisk together the flours, sugar, baking powder, salt, and cinnamon. In a smaller bowl, whisk together the oil, honey, milk, egg, and mashed banana. Add the liquid ingredients to the dry ingredients, mixing gently just until blended. Don't overmix. If you have a nice non-stick skillet, and you prefer to add no more fat to the pancakes, go ahead and use that. Heat it over medium heat for a minute or so. If using a regular skillet, be sure to add 2 to 3 Tbsp. of vegetable oil (I used canola) to the heated pan. Let the oil heat up, still over medium heat. When your pan is hot, pour the batter on in 1/4- to 1/3 cup portions. Let the pancakes cook until quite a few bubbles start to form on the top of each one; flip them over with a thin spatula and cook them until their bottoms are quite golden. It shouldn't take more than a few minutes. Keep going with the remainder of the batter. 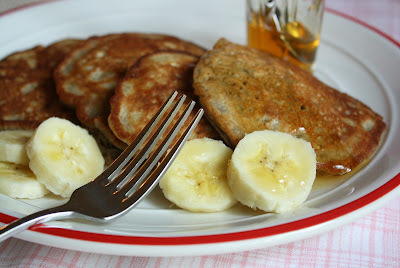 Serve the pancakes with honey and banana slices on the side. Fresh Apple Cake with Boiled Cider Glaze . . .
Maybe you saw from my previous post that my father passed away recently? I mention this again only because, while he was ill over the latter half of the summer, my urge to bake just about completely fizzled. It was kind of like my inner pilot-light temporarily flickered out. I had other things on my mind, of course, and my energy was directed elsewhere. I guess baking for pleasure seemed like a frivolous pursuit. 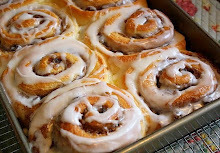 But now, as I restart my internal baking engine, so to speak, I realize that I want to make things that are distinctly comfort inducing--dishes that remind me of why I love baking to begin with, and that evoke the sense of contentment I knew as a kid while watching my mom move confidently about her kitchen. 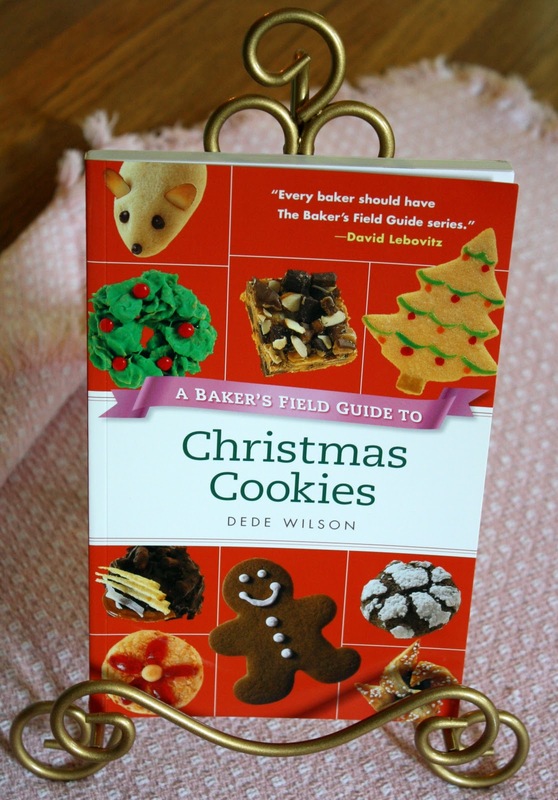 I can still see the silver beaters on her Sunbeam mixer whirling in place as she hovered nearby, spatula poised, her blue eyes riveted on a bowl of pound-cake batter or thick chocolate icing. I don't think it would be stretching the truth to say that my dad enjoyed just about every food she ever prepared, and each night as we finished dinner, he'd thank her for having made it. I know that left an impression on me. My dad loved the fact that I was always baking and I recall how surprised and charmed he was a couple of years ago when I informed him I was entering culinary school part-time to study the baking and pastry arts. He often asked me what I was working on, and occasionally requested that I make homemade bread for him, or peanut butter cookies, or creamy clam chowder. Eventually, he couldn't keep it in his mind that I was in culinary school at all, but that was okay. Though in the last several weeks he couldn't have told you what decade it was or what he'd had for lunch one minute after he ate it, he still recognized the most important things in life and, even up to the end, was still alert enough to give and receive expressions of love. I'll always be grateful for that. 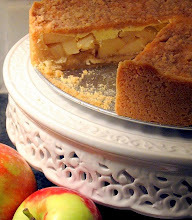 That desire of mine to bake comfort food brings me to today's fresh apple cake. 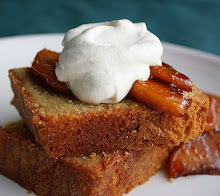 Adapted from a recipe for apple rum cake found in pastry chef Nick Malgieri's book, Perfect Cakes, I omitted his use of the rum altogether and substituted a larger amount of boiled cider for the primary flavoring ingredient. 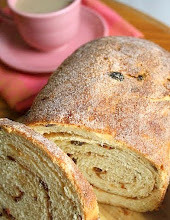 I also used boiled cider in the glaze instead of rum, and I left raisins out of the batter as well. What the heck is boiled cider, you may be asking? It's exactly what it sounds like. It's apple cider that has been slowly reduced in much the same way maple sap is cooked down into maple syrup. You can buy boiled cider in a bottle, like the kind I used for this recipe, or you can try making it yourself by simmering two cups of cider in an uncovered saucepan over low heat until it's shrunk down to 2/3 of a cup (that last bit of advice I found in my old copy of Richard Sax's indispensable book, Classic Home Desserts: A Treasury of Heirloom and Contemporary Recipes). Boiled cider still tastes exactly like cider, but in a richly concentrated form; it's very good. I adjusted this cake recipe further by adding in restrained pinches of nutmeg and cinnamon--only enough to hint at their spicy presence, and of course I reworded it to reflect exactly what I did. 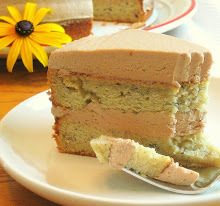 Moist and satisfying, this simple cake is just right for early fall. Not too sweet, and the use of the boiled cider really pumps up the apple flavor. 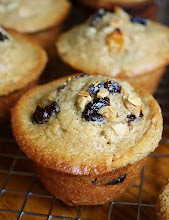 A good bet for brunch, dessert, or a nice afternoon snack with a cup of tea. Yield: One 9" cake, baked in a springform pan. Preheat oven to 350 degrees. Butter the bottom and sides of a 9" springform pan, line the bottom of the pan with a 9" parchment paper circle, then butter the parchment. Mix the sliced apples and the 3 Tbsp. of boiled cider together in a bowl. Set aside. 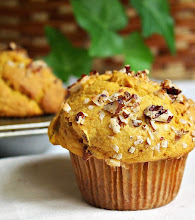 In a medium bowl, whisk together the flour, baking powder, kosher salt, cinnamon, and nutmeg. In the large bowl of your mixer, using the paddle attachment, beat the butter and sugar together on medium speed until fluffy and light. One at a time, beat in the eggs, still on medium speed. Add in the vanilla. Take the bowl off the mixer. Using a rubber spatula, fold in half the flour mixture. Set a colander over an empty bowl and dump the apples along with their liquid into it. Let them drain a minute or so. Add the milk into the cider drippings, then pour this liquid into the batter and stir it in. 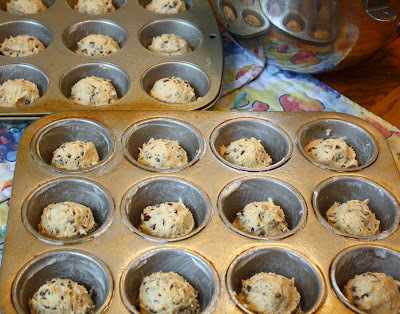 Fold the remaining flour into the batter. Evenly spread half of the batter into the bottom of the prepared springform pan. 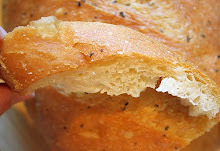 Use a small offset spatula (ideally), or the back of a spoon, to spread it out. 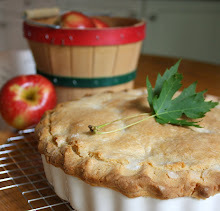 Scatter all of the apples over the top of the batter (they do not need to be neatly arranged); try to leave just a narrow margin of uncovered batter close to the sides of the pan. 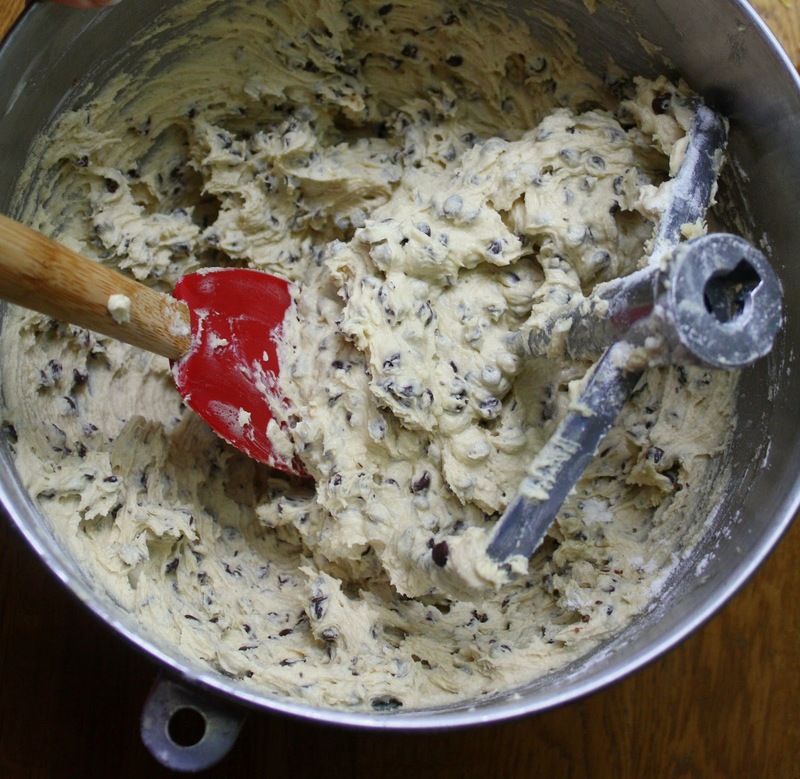 Plop the remaining batter over that and spread it out smoothly. Bake the cake on the middle rack of your oven for approximately 55 to 60 minutes, or until the cake feels firm, is golden brown, and apples seem tender. Test it with a toothpick if you like. Cool the cake in its pan, set on a rack, for 15 minutes before attempting to remove the sides of the pan. Run a thin metal spatula or knife around the edge before removing the sides. Then, invert the cake quickly and carefully onto a flat plate; lift off the bottom of the pan, peel off the parchment circle if it's stuck to the cake, then quickly reinvert the cake-bottom back onto the cooling rack. Let the unpanned cake cool fully on the rack. 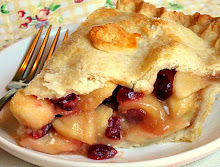 With the confectioners' sugar in a medium-small bowl, begin adding in the boiled cider one tablespoon at a time, adding in more and stirring continually until all lumps are gone and the glaze is as thick or thin as you prefer. 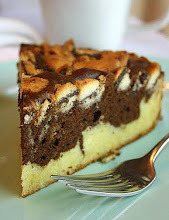 Drizzle the glaze over the cooled cake, or serve it warm, drizzled over individual slices. You may have noticed I haven't been posting as much as usual this summer, and there's been a good reason for that. My dad, whom we affectionately called Grandpa John, passed away yesterday morning at the ripe old age of 83 after a steep decline that began in July. 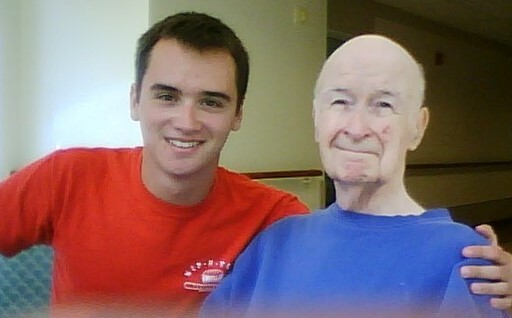 I was spending some time with him everyday and I am so glad I had the opportunity to do so. He was a really sweet guy. Kind of a quiet man, he loved opera music, the Detroit Tigers (one of his favorite phrases was, "Don't let the Tigers break your heart! "), difficult crossword puzzles, his grandsons Charlie and Nathan, and he never could resist a fluffy slice of coconut cream pie. He's back with my mom now, I like to think, and I'll bet they're probably holding hands and smiling, somewhere out there in the great beyond. I miss him already. 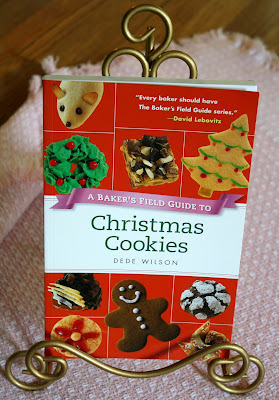 I am looking forward to baking again very soon, and hope to be back in the blogging saddle again in a week or so. I may just have to make a nice coconut cream pie . . .